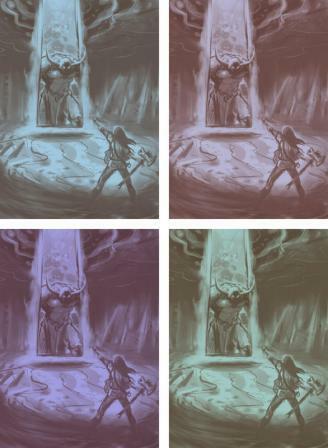 Now that we've made a decision about what will be depicted on the cover of our upcoming book (THE SUMMONING), the next task was picking a color. Again, Scott made up four thumbnails to choose from. Basically, he made the base color orange and overlaid other colors to come up with four duo-tone color options. As he pointed out to us, the colors in these thumbnails are flat (no highlights or shadows painted in). Obviously, there was no point his doing that until we'd made the fundamental color decision. Earlier this week, we emailed him with our choice, which is #1, the sort of teal-colored one at the top left. Before making our decision, we ran it past our graphic artist (Tori Smith), who assures us she could easily work with any of these. Now Scott goes to work in earnest, actually painting our cover. Can't wait to see the end result! Stay tuned. We'll share it with you when we get it.